As you approach An Creagán visitor complex turn left and walk up the slope between the large stones at the beginning of the route. As you come to the brow of this incline you will have a view to your left across Creggan Bog. This is small piece of undeveloped raised bog which is home to unique colonies of plants including 14 different types of sphagnum moss, cranberry, crowberry, bilberry and the insect eating sundews, amongst others. 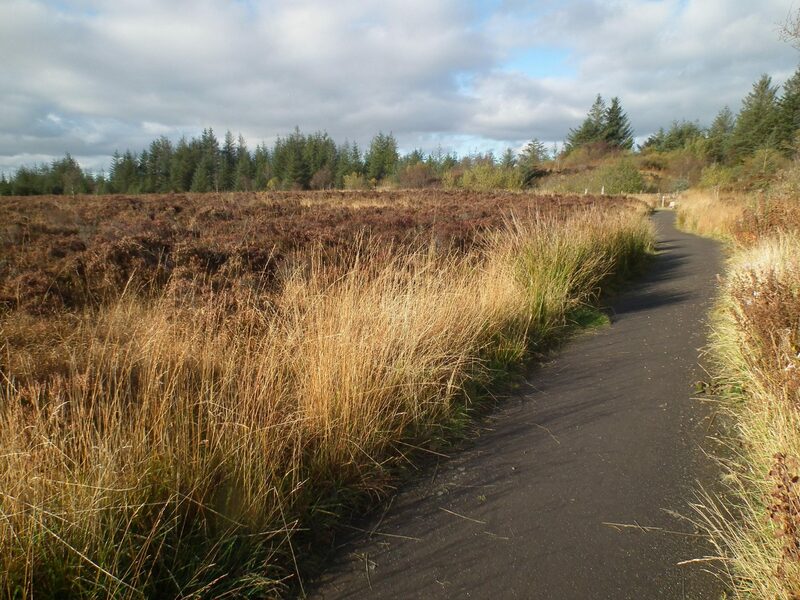 A gravel path leads you along the edge of this bog with a short boardwalked outshot giving you the chance to get out into the midst of this soft, peaty landscape without getting your feet wet. Continuing along the gravel path you will notice to your right the hollowed out landscape of a decommissioned gravel quarry. As you carry on up a further incline you will enter the forest. Around half a kilometre into the forest you will notice the clear-felled area to the right which has started to regenerate from the seed dropped into the soil from the mature trees before they were removed. The felling allows a view across to Sawel, the highest peak of the Sperrin mountains in the distance. The occasional standing dead tree trunk provides a perch for passing raptors. Carrying on past this clear-felled area you will come to a cross roads.